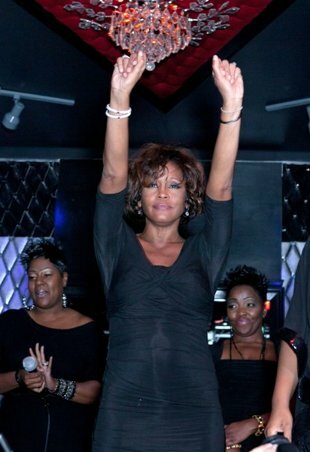 Art and Information - Anyone who'd followed reports of Whitney Houston's bizarre behavior in the days leading up to the Grammys had to have been "shocked, but not surprised" at reports of her demise, as the saying goes. Thursday in particular had been an obviously rough day in public for the troubled singer, whose appearance and behavior raised eyebrows among reporters, photographers, and regular folks who witnessed her erratic rounds. First she first visited Brandy, Monica, and Clive Davis at rehearsals for the mogul's pre-Grammys party, where a Los Angeles Timesreporter described her as reeking of alcohol, "visibly bloated," and "disheveled in mismatched clothes and hair that was dripping wet with either sweat or water." According to the Times, when Houston wasn't mugging and gesticulating wildly for Brandy and Monica — who were doing a media junket, as well as preparing a duet — she was alternately skipping around the lobby or "wandering aimlessly" around the Beverly Hills Hotel grounds. Reportedly, guests had even called security to report the singer doing handstands by the hotel pool. Houston's Thursday was about to get worse… way worse. That evening, she attended a party headlined by Kelly Price at the Tru nightclub in Hollywood. As she exited, seeming intoxicated, photographers took close-ups of her legs, which appeared to be spotted with blood streaks, along with scratches on her wrists.